in Boston for over 15 years. 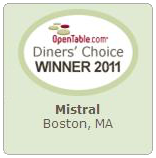 Located in Boston’s stylish South End, Mistral showcases Chef Jamie Mammano’s uncomplicated French Mediterranean cuisine, highlighted with the seasons’ finest ingredients. 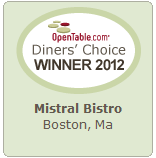 Use the bar above to reserve your table at mistral. A Contemporary Mediterranean Restaurant featuring both innovative & classic preparations of the finest seafood available globally. 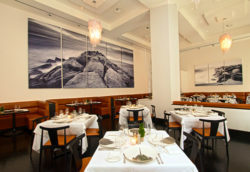 Located in Beacon Hill, Mooo…is a modern steakhouse located within the luxurious XV Beacon Hotel. The warm, modern décor provides a relaxed, sophisticated atmosphere. Inspired by its namesake trattoria, L’Andana offers Tuscan-inspired, wood grilled cuisine. Located on the North Shore in Burlington, L’Andana offers a menu that captures the simplicity and freshness that defines Tuscan cuisine. The Inn @ St. Botolph wraps a wealth of luxuries in a tidy and affordable package for discerning travelers. It’s the perfect destination for corporate guests, romantic getaways or families desiring the intimacy of a private residence dressed up with refreshingly customized services. 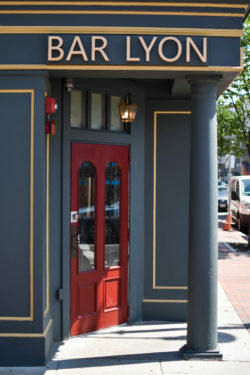 Located in the South End, Bar Lyon is designed after a classic French Lyonnaise bouchon; accepting walk ins only(no reservations). If you cannot find the reservation availability you are looking for online, please contact our reservation department at T.617.867.9300.